It was late morning before the mid-winter sun crested the ridge and cast warm rays into the small valley where Michael lived. His gum-wood cottage had been built, lived in, and abandoned years ago by mill-hands who used to log trees from the surrounding bush. Michael had repaired it and moved in a few years ago. A down-home place, but it served the purpose. It had been a fairly mild winter, lots of clear sunny days and cool crisp nights. The surf had been more than good and winter swells had generously favored the local breaks as well as those along the coast in both directions. A stream of grey smoke rose from Michael’s chimney, met the morning breeze, then merged with the atmosphere. Inside he sat in an old wicker chair before the fireplace and gazed at the dancing flames and glowing embers, occasionally tossing on a piece of wood or shifting the coals with the poker. Lately he had spent most of his mornings this way, just sitting by the fire and reading or thinking. Today, as he waited for Varuna, Michael’s mind drifted back through the last several months. He had been through a lot of changes and he felt them to be good ones. “Of course I’ve changed”, Michael mused. “Been changing all my life. That’s what this world is all about … but somehow these past few months seem more significant. Before change had always come from without and had taken place without my really being aware, like changes in thinking laid on me by schools, parents, social forces, and so on. This time, though, it’s different. It’s a controlled change with direction. I’m moving because I want to move, not because someone or something is moving me. The change is coming from within myself and I’m watching the whole thing happen. Although in the ultimate sense I know I’m not the Controller, I’m beginning to feel I have a say in my destiny, that my future is more or less in my own hands in the sense that more and more I’m beginning to see where I am as well as where I want to go.” His thoughts were broken by the sound of Varuna’s car coming down the dirt track and rattling across the wooden bridge opposite the veranda. Michael looked out the window at the waiting vehicle as he pushed himself erect from the old chair. Walking to the kitchen, he grabbed the waiting sack of homemade cookies and a thermos of hot chai, and then he slipped out the back door. By the time he pulled his wetsuit off the line and rounded the corner to the front of the house, Varuna had already taken his board from the porch-front and was strapping it to the roof of the car. “G’day, mate!” he called warmly to Michael as he tugged the strap tight and fastened the board securely in place. “G’day yourself,” Michael responded with a big smile. He was always glad to be around Varuna, and in a way felt it a privilege to be his friend, for he admired him deeply. Twenty minutes later they were sitting outside the break at Hidden Bay. Eight-foot sets moved through the deep water and deposited themselves on the reef. Varuna took off behind the peak, and deep within the barrel of the wave he streaked along at the same velocity of the lip until he reappeared and drifted over the back of the wave. By now the dolphins were only about ten yards away, and by the way they were leaping about, it was obvious they were in a playful mood. Varuna slipped smoothly from his board and swam slowly toward the dolphins. “What are you guys doing here?” he said gently, in the same manner one sometimes talks to his dog. “Come for surf, did you?” The dolphins obviously didn’t understand the words, but they seemed to be picking up on the vibrations. 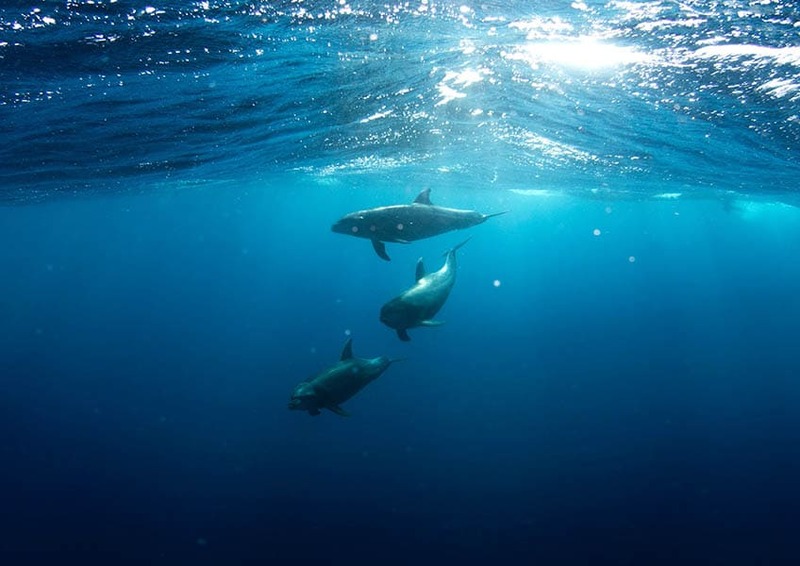 One of them poked his head from the water only inches from Varuna’s face, and when Varuna slowly raised his hand to touch him, the dolphin showed no signs of fear. The dolphins stayed and played for nearly an hour, and they caught more waves than Michael and Varuna. Shortly after the dolphins’ departure, Michael paddled in and lit a fire on the beach. By the time Varuna joined him, the fire was raging. Michael and Varuna sat in silence for a while watching the surf and enjoying the warmth of the fire. The wind was barely blowing, just enough to lift a little mist off the crest of the breaking waves. Now and then the cry of a seagull overhead broke the hypnotic drone of the roaring sea. Later that day Varuna and Michael took a walk around the perimeter of the bay. At the bay’s edge where it met the open sea there was a natural rock jetty, which had been built by the subtle workings of Mother Nature. The combination of erosion and landslide from the cliff’s edge, added to the ocean’s lapping fingers, had created it as well as a series of small but rugged tide pools near the beach side of the bay. The pools were abundant with sea life, and walking among them between surfs was one of Varuna’s daily habits. As they walked, Michael reflected on the conversation by the fire and tried to absorb the ideas Varuna had spoken about. Under his arm was the bag of cookies and thermos of hot chai. They soon sat by the edge of a small pool for an afternoon snack. “What do you mean by perfection?” asked Varuna. Varuna was silent, and Michael could tell that he was thinking about what he had just said. After a moment Varuna turned slowly to Michael, their eyes met, and Varuna looked at Michael deeply, intently. Michael’s brow furrowed as he tried to understand Varuna’s assertion. He didn’t need to voice his request for explanation. Varuna could see his mind. They finished their meal in silence, then slowly walked back to the boards. The sun was still high enough in the sky to chase the winter’s chill from the air, and Michael nestled himself down out of the breeze between two small sand dunes. He watched the waves breaking for a while, but it wasn’t long before he was peacefully asleep. Varuna walked to the other side of the bay and then back to his board. He picked it up and walked to the water’s edge. As he rubbed some sand on the deck to rough up the wax, he called over his shoulder to Michael, who by this time had curled up and rolled over on his side. Michael yawned and sat up, then yelled something incoherent back at Varuna about letting a poor man sleep. Varuna just laughed and paddled out to sea. Born February 1 1949, in the USA, Tusta Krishna Das is a much beloved internationally known teacher of sanatana dharma, the eternal religious principles outlined in Bhagavad-gita, Srimad Bhagavatam and other Vedic literatures. Since 1970, he shared his insights and understanding with tens of thousands around the world, delivering lectures on Bhagavad-gita in more than 20 countries. He received a Masters degree in Gaudiya Vaishnava philosophy through..
August 21, 2017Who Is Krishna?